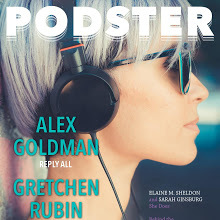 Podster is a new digital magazine about podcasts and podcasters. It comes from Shelf Media. The very first issue has been released, and you can check it out for free. So, I did. The first issue is a total of 53 pages. It felt like the right length as I was reading through it. The cover is eye catching and they used nice font for the name of the magazine. If Podster was sitting on the magazine rack at a Barnes & Noble, I’d probably pick it up and start flipping through it. It stands to reason that a magazine about podcasting is presented in digital format. After all, once you get involved in creating and producing one or more podcasts on a regular basis, posting the show notes for each episode, and sharing links to it on social media – the internet becomes your neighborhood. I found the content of the magazine to be interesting, well written, and incredibly relevant for podcast creators as well as podcast listeners. The January 2016 issue includes interviews with Alex Goldman from Reply All, Gretchen Rubin from Happier with Gretchen Rubin, and Elaine McMillion Sheldon and Sarah Ginsburg from She Does. Each interview includes easy to spot links you can click on to hear one of their episodes. Alongside the interview is a list and brief description of the podcasts that the interviewee listens to. There is a section where an excerpt of an individual podcast episode has been transcribed (with permission from the podcaster, I’d assume). Again, there are links that take you directly to whatever podcast caught your attention. No need to “Google it”! There is also plenty to enjoy of other content that I haven’t described here. I could not help but notice that this first issue of Podster is rather ad heavy. To my surprise, I was not annoyed by the ads because all of them were very relevant to podcasting. As a result, I was shown ads that were actually interesting to me. I hope Podster keeps that up. Overall, I liked Podster well enough to subscribe to it and am looking forward to see what comes next.